A possible scenario for the progression from a fully functional cecum to the current human appendix was put forth by Charles Darwin. He suggested that the appendix was used for digesting leaves as primates. It may be a vestigial organ of ancient humans that has degraded to nearly nothing of its original purpose, or evolved to take on a new purpose over the course of evolution. 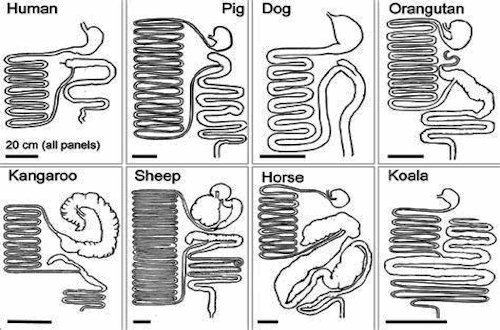 The very long cecum of some herbivorous animals, such as found in the horse or the koala, appears to support this theory.